The first employment paper in Malayalam, Thozilvartha, was aninstant triumph among the youths of Kerala. Reporting almost everyemployment opportunities in Kerala, the paper proves to be analternative for the State's informative cell in service sector. Computer, Technology, Internet, Mobile Know hows in simple Tamil.Tamil Computer is the first vernacular magazine on Computers andTechnology. Tamil Computer ushered in a new era for technologycoverage in the Tamil print media. Readers who were morecomfortable with Tamil than English were happy to read aboutComputing in their mother tongue as it offered them the opportunityto understand computers lot better than they would have otherwise.The simple motive behind Tamil Computer is to present the Tamilreader with all the game-changing improvements in the world ofComputing and Technology in simple and lucid Tamil. Tamil Computerwas presented with the "Best Technology Magazine" award for theyear 1999 by the Government of Tamil Nadu. Modern Kheti, as the name indicates, relates to the modernagricultural techniques; conservative and cash crops, alliedprofessions and farm machinery through training programs orupcoming events on a national and international level. Introducedin 1987, it is the leading and most widely read agriculture basedmagazine throughout Northern India. Punjab and Haryana, extensivelyknown as the food grain basket of India, has in almost everyhousehold Modern Kheti, as it caters to every aspect of farminglike growing of seasonal crops, their problems & solutions,conservative and cash crop farming. It also covers – fishery,poultry dairy, bee keeping, floriculture, horticulture etc. Themain aim of Modern Kheti is to keep up the spirit of farming, bonddifferent regions and help agriculture grow. It inspires the youthto take up agriculture as farming with a lot of emphasis on organicand profitable farming. It keeps in mind the health and prosperityof all i.e. taking mankind and nature together. It is publishedfortnightly in Punjabi and Hindi and covers the whole of Punjab,Haryana, Rajasthan, Himachal Pradesh, Uttaranchal etc. It isundoubtedly one of the best mediums trying to provide healthyinformation. Foremost health magazine in Malayalam, Arogya Masika was firstprinted in the year 1997. Published monthly, it is the largestselling periodical on health and wellbeing. Daily Malayalam News Papers brings you all the web portals ofleading news papers in one single app. Through this app you canaccess all of your favorite news website with ease. Whether it isnews about your favorite sports or sports star or a breaking newsthat you have just heard. Entertainment news updates about moviesor your favorite stars or the latest Business news that can helpyou in your new venture. Health related articles that might saveyour life. International news or may be the trending Indian news.Hot news which includes National or local news from any part ofIndia. If you are a foodie then Cookery or food related updates andarticles. If you are a person who likes to know a thing or twoabout your future, horoscopes. Stock updates if you are anenthusiast. If you are looking out to buy something then there isclassifieds. If you like to travel then Traveling hacks orarticles. You can find everything that you can find in you favoriteMalayalam news websites has been included in Daily Malayalam NewsPapers. 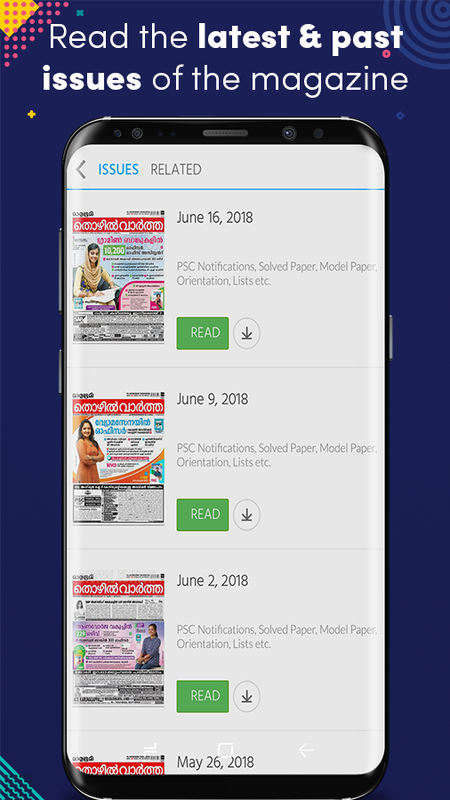 An app that can be helpful in many ways.The mostinteresting feature about Daily Malayalam News Papers is that allthe news have been categorized and arranged. That is if you clickon the sports section in this app. A new page will appear in whichfamous sports news websites has been listed. you can directly go totheir sports page and get the updates that you have been looking.Another important feature about Daily Malayalam News Papers isthat, the app has been programmed that it is so light so thatopening the app won’t consume data that much.Which one are theleading news websites in Kerala? Everyone will have their ownopinion regarding this. That’s the reason why we have included newsfrom all the available news websites in Malayalam language in DailyMalayalam News Papers. Here are the list of news websites that hasbeen included:• Mathrubhumi• Manorama• Madhyamam News• ReporterTv• Deshabhimani• Janmabhumi• Kvartha• Media One Tv• Evartha• MetroVaartha• Kerala Online News• Pathram Online• Malayalam ExpressOnline• Vyga News• Bignews Live• Filmi Beat• M3 db• CiniDiary• South Live• Cinema Scoop• Dool News• Boolokam• Gizbot• NewsMoments• Boldsky• Pachakam Online• Native PlanetAlthough the newsof Daily Malayalam News Papers App has been categorized intosection. On the top of the front screen in this app there is anicon named as Vartha if you click that you can access page ofMalayalam news website from their home page. In this page you canaccess the breaking news headlines and any other section in thatnews website with ease.Download this app and get the latestbreaking news, daily malayalam news and headlines, and the topstory that have went viral in world and in India in one single app. You can use this app to view Mathrubhumi Calendar in your phone ortab. You can see 'Muhurthangal', 'Rahu/Gulika/Yamandaka','Visheshadivasangal' and 'Nakshathrabhalangal'. Mathrubhumicalendar App with Malayalam date,Tamil date, Saka calendardate,Hijri (Hijra) date, Govt. holidays , Holiday information, fullmoon/Amavasi and other astrological details.Also you can seedistrict wise current days event and you can set reminder for yourevents. Proceso semanario de información actual y crítica de temaspolíticos, sociales, cultura, espectáculos, religión, entre otros,tanto nacionales como internacionales. Inside Showbiz is for aspiring showbiz enthusiasts. It gives accessto the intimate lifestyle details of their favorite celebrities andup-and-coming personalities with news and features written from ayoung, witty , intelligent, and fun perspective.